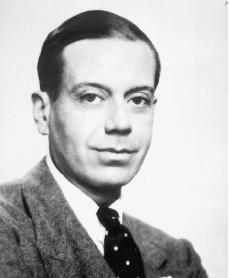 American composer Cole Porter wrote songs—both words and music—for more than thirty stage and film musicals. His best work set standards of sophistication (appealing to good taste) and wit seldom matched in the popular musical theater. Cole Albert Porter was born in Peru, Indiana, on June 9, 1891, the son of a pharmacist. His mother was determined that her only son become a creative artist, while his wealthy Midwestern pioneer (someone who settles new land) grandfather was determined that he enter business or farming. Cole's mother's influence proved stronger, and Porter received considerable musical training as a child. He began playing violin and piano at age six. He learned circus acrobatics watching the Hagenbeck and Wallace circus, which spent its winters nearby. By 1901 he had composed a one-song "operetta" (a short opera) entitled The Song of the Birds, and a piano piece, "The Bobolink Waltz," which his mother published in Chicago, Illinois. Porter attended Worcester Academy in Massachusetts, where he composed the class song of 1909. At Yale (1909–1913) he wrote music and collaborated (worked with others) on lyrics for the scores of several amateur shows presented by his fraternity (social club at colleges and universities) and the Yale Dramatic Association. Porter then entered Harvard Law School. Almost at once, however, he changed his course of study to music. Before leaving Harvard he collaborated on a comic operetta, See America First (1916), which became his first show produced on Broadway. It was a complete disaster. In 1917 Porter was in France, and for some months during 1918 and 1919 he served in the French Foreign Legion. After this he studied composition (music writing) briefly with the composer Vincent d'Indy in Paris, France. Returning to New York, he contributed songs to the Broadway production Hitchy-Koo of 1919, his first success. Also in 1919 he married the wealthy socialite (someone who keeps company with well-respected people) Linda Lee Thomas. The Porters began a lifetime of traveling on a grand scale and became famous for their lavish parties and the circle of celebrities in which they moved. Porter contributed songs to various stage shows and films and in 1923 composed a ballet, Within the Quota, which was performed in Paris and New York. Songs such as "Let's Do It" (1928), "What Is This Thing Called Love" (1929), "You Do Something to Me" (1929), and "Love for Sale" (1930) established him as a creator of worldly, witty, occasionally risqué (off-color) lyrics with unusual melodic lines to match. In the 1930s and 1940s Porter provided full scores for a number of bright Broadway and Hollywood productions, among them Anything Goes (1934), Jubilee (1935), Rosalie (1937), Panama Hattie (1940), and Kiss Me Kate (1948). These scores and others of the period abound with his characteristic songs: "Night and Day," "I Get a Kick out of You," "You're the Top," "Anything Goes," "Begin the Beguine," "Just One of Those Things," "Don't Fence Me In," "In the Still of the Night," and "So in Love." Serious injuries from a riding accident in 1937 plagued Porter for the remainder of his life. A series of operations led to the amputation (cutting off) of his right leg in 1958. In his last years he produced one big Broadway success ( Can-Can; 1953). Cole Porter died on October 15, 1964, in Santa Monica, California. Porter's songs show an elegance of expression (wording) and a cool detachment that are a perfect example of the kind of sophistication unique to the 1930s. He was also a truly talented creator of original melodies. Like George Gershwin (1898–1937), he frequently disregarded the accepted formulas of the conventional popular song and turned out pieces of charm and distinction. Citron, Stephen. Noel and Cole: The Sophisticates. New York: Oxford University Press, 1993. Grafton, David. Red, Hot & Rich! : An Oral History of Cole Porter. New York: Stein and Day, 1987. Howard, Jean. Travels with Cole Porter. New York: Abrams, 1991. McBrien, William. Cole Porter: A Biography. New York: Alfred A. Knopf, 1998.